The major airlines are bracing for yet another round of snow and will no doubt issue additional flight change fee waivers for passengers affected by the series of winter storms. Winter Storm Quinn, which pounded the Rockies, will head East, producing blizzard conditions in the northern Plains, and spreading snow and wind through the Upper Midwest and Great Lakes. The storm will conclude its cross-country journey as a Northeast coastal storm with snow and strong winds during the middle portion of the week ahead. Snow from Quinn will first begin to spread into the interior Northeast by Tuesday or Tuesday night, but the lion’s share of the storm will occur Wednesday-Thursday. Right now, the best chance for heavy snow exists mainly northwest of Interstate 95, from northern New Jersey, northeast Pennsylvania and southeast New York to parts of Connecticut, Vermont, Massachusetts, New Hampshire, and Maine. Hundreds of thousands were still without power Sunday after deadly Winter Storm Riley battered parts of the Mid-Atlantic, Northeast and New England. The storm has been blamed for at least nine deaths. Two of the victims – a 6-year-old boy in Chester, Virginia, and an 11-year-old boy in Putnam Valley, New York – were children. Meanwhile in Europe, at least 16 people have been killed by a series of winter storms and bitter cold that swept across the continent over the past week. Nicknamed “The Beast from the East,” the cold front caused travel chaos, with hundreds of flights canceled in the United Kingdom, Ireland and Switzerland. Trains broke down. Motorists found themselves stuck on highways and trapped in frosty conditions for hours. The big chill also froze canals in the Dutch capital, Amsterdam. Ice on the historic Prinsengracht canal was thick enough for residents to lace up their skates and glide across its frozen surface. Tourists without skates slid across the ice, taking selfies. Not to be left out, Rome had a rare snowfall picking up a few inches of snow early last week, which prompted school closures and impacted public transportation. 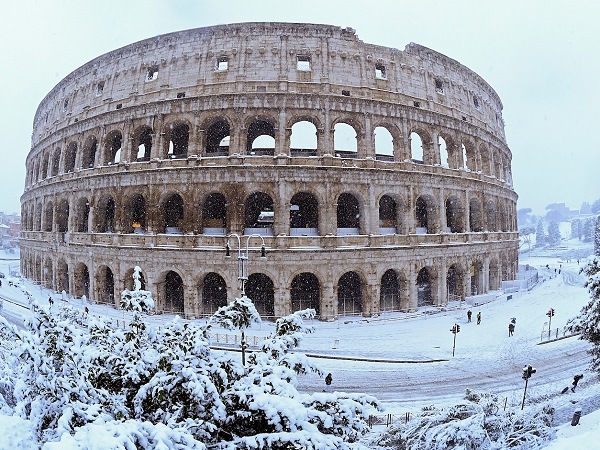 Rome’s location near the Mediterranean Sea typically prevents accumulating snow from occurring in the city during winter. Reuters reported that this was the heaviest snowfall in Rome in about six years.